Barbiel also is one of the 28 angels of the 28 mansions of the moon. Each of the 28 phases of the moon has a corresponding angel. October is a month of change of seasons, from summer to winter. October falls in the very heart of autumn. It is said that Barbiel is with us whenever change enters our lives. He offers us the support we need to weather the transformation. Barbiel stands among the Ninth Order of Angels. These are keepers and teachers of the laws and they are known as Powers, or Guardians of order. This realm of angels are like a celestial police force. They work through the human sixth sense and are the angels of warning. Like the colors of autumn, the colors of Barbiel are green and gold. 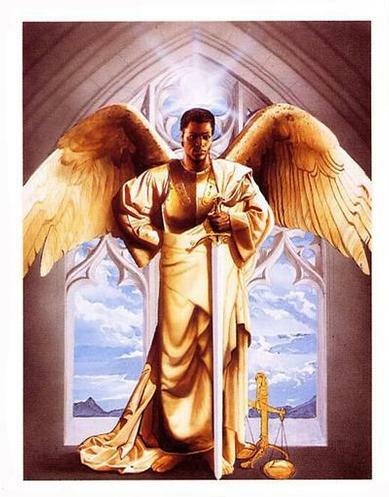 This angel is a warrior and its symbol is a flaming sword. He will defend your home, property and children. When summoning Barbiel or any of the Powers, burn a white candle for Divinity and a yellow candle for Powers.